Our tour takes us to one of the UKs best Christmas Markets - Chatsworth the magnificent Derbyshire home of the Duke & Duchess of Devonshire set amid breath-taking scenery, be one of the first this year to see the Great House decorated for Christmas with foliage, lights and candles evoking the spirit of Christmas. we depart from your selected pick-up point, join your coach and journey to Bakewell where we have time to look around the town and enjoy a break for lunch or perhaps a coffee and slice of Bakewell Tart from the Original Pudding Shops, before continuing to your hotel where tea/coffee await you, time to relax at your hotel before dinner. After a leisurely breakfast we depart for Chatsworth, every year the majestic estate of the Duke & Duchess of Devonshire is transformed into a festive wonderland with its rooms lavishly decorated with garlands, twinkling lights and candles, complemented by the smell of Christmas trees and the sounds of carols which add to the atmosphere. Time also to explore the popular Christmas Market with over 100 stalls selling all sorts of gifts. This morning we must bid farewell and begin our journey home with refreshment stops enroute, arriving mid-afternoon. 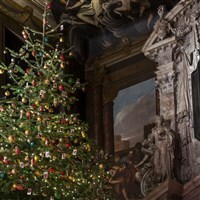 · Admission Chatsworth House, Gardens & Christmas Market. The first purpose built railway hotel in the world, all rooms feature TV, hairdryer, tea/coffee making facilities, lounge, bar and restaurant. This hotel is ideally situated for visiting Chatsworth House. From your home pick-up point join your coach and journey to Bakewell where we have time to look around the town and enjoy a break for lunch or perhaps a coffee and slice of Bakewell Tart from the Original Pudding Shops, before continuing to your hotel where tea/coffee await you, time to relax at your hotel before dinner. This morning we must bid farewell and begin our journey home with refreshment stops enroute, arriving mid afternoon. The first purpose built railway hotel in the world, all rooms feature TV, hairdryer, tea/coffee making facilities, lounge, bar and restaurant. Ideally situated for visiting Chatsworth House.